Every once in a while you see a film and it strikes you as being something exceptional. Maybe the story, the cast, etc. Recently I viewed “Ida” on Netflix having read about it in American Cinematographer some time ago and obviously didn’t see it in the cinema. What I really responded to in the film was the pure visual storytelling. The Cinematography is excellent. They came up with a way of composing many of the frames with extra room above the characters which is a bold move. They framed the movie in 1.33:1 which gives it a classic pre-50s feel along with being in black + white. Overall I think it is the simplicity of the film that was interesting to me. See the film and check out the details and analysis of the cinematography on the ASC website. So I finally embrace the LUT and want to try the cool LUT I just found here but the Speedgrade manual and Adobe help aren’t exactly helpful. What is a LUT? This Wiki will explain it. After playing around in various forms, a restart and lots of worthless Google searches I stumbled on the solution by accident. 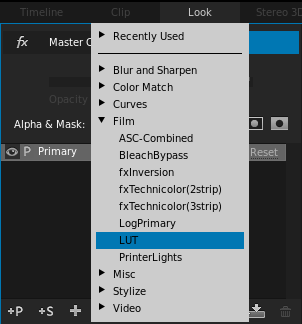 In the lower left corner, click on the + icon to open a menu and select FILM and choose LUT. This will allow you to select the LUT you have downloaded, is available as a default or something you have created in another application. If you are looking to try out a LUT without paying, try out the Instagram looks I found here. I get a lot of questions about filters from students and other professionals. In the early days of shooting digital with a Sony PD150 I used a 1/4 BPM (black pro mist) to take the digital edge off of the video. Here is a comprehensive video testing out the current offerings of Tiffen in a formal test. Check it out. Tiffen 4K Diffusion Test – 1080P from The Tiffen Company on Vimeo.